After the ABO system, the Rh (Rhesus) blood group system is regarded as the second most important blood group system, as some of the severe hemolytic transfusion reactions and most hemolytic disease of the fetus and newborn (HDFN) cases are associated with antibodies to the Rh group antigens. The Rh system consists of over 50 red cell antigens. There are five main Rh red cell antigens—D, C, c, E, and e—that involve most clinically significant transfusion complications. These five are the focus of this article. Two separate genes for the Rh system are found on chromosome 1. One gene, RHD, encodes for the D antigen. Individuals with the D antigen present on their red blood cells are labeled as "Rh (D)–positive." Those who do not have the D antigen are labeled as "Rh (D)–negative." A second gene, RHCE, encodes for a combination of CE or ce antigens together. RHD and RHCE are highly homologous to each other. In essence, RHCE is the original gene, and RHD is a duplication of RHCE. The RHD and RHCE genes encode proteins such that each crosses the red cell membrane 12 times, with 6 protein loops on the exterior of the cell membrane. It is important to note that the Rh blood group system has more than one accepted nomenclature. Most of this review uses the Fisher-Race nomenclature, which designates the antigens with letters DCE in either upper or lower case. The Weiner system uses the letters R, r; subscript y (y); z; the numbers 1, 2, 0; and symbols for prime (', "). These two nomenclatures are listed in the tables below. "d" = an individual who does not express the D antigen. The RhD protein has two clinically significant variations, "partial D"” and "weak D." Because the D antigen comprises multiple epitopes, red cells that lack components of the D antigens are often described as "partial D." Molecular studies have identified that many partial D phenotypes result from amino acid substitutions or a protein segment switch on the extracellular portion of the RhD protein. Individuals with partial D are usually typed as Rh-positive but may form anti-D when alloimmunized. Rh antigen diagram. Image created by Jaye Parsley. 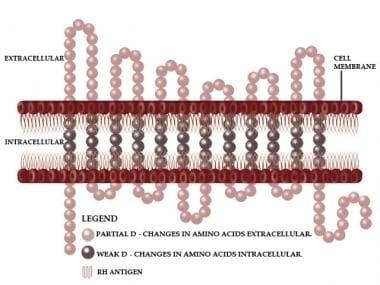 Red cells that carry weak forms of D antigen are classified as "weak D," which usually results from amino acid substitutions within the internal portion or in the membrane-crossing portion of the RhD protein causing quantitative changes. An individual with weak D has a decreased amount of D antigens expressed on the red cell. There is significant variation in terms of interpretation and reports of transfusion recipients with weak D. A 2017 review estimates 0.2%-1% of routine RhD blood typings result in a "serological weak D phenotype." A 1999 survey of 3000 participating institutions showed that 50.7% would consider the patient "Rh(D)–positive," 20.9% would report the patient as "Rh(D)–positive, weak D–positive/variant," 20.1% would report the patient as "Rh(D)–negative, weak D–positive/variant," and 3.3% would report the patient as "Rh(D)–negative." These same institutions also reported their actual transfusion policies; the survey showed that 43.5% would administer Rh(D)–negative blood, 42.4% would give Rh(D)–positive blood, and 10.2% of the institutions would provide Rh(D)–negative blood to a childbearing woman. Therefore, there is no current consensus as to how to interpret weak D individuals. The formation of Rh antibody usually requires an initial exposure, either through a transfusion or pregnancy. During the first exposure to foreign Rh antigen, the host’s immune system will not produce clinically significant amounts of antibodies that cause hemolysis. Rh antibody causing hemolysis is seen after the second and subsequent exposures. Of the five most common clinically significant Rh red cell antigens, D is well known for causing the most severe immunogenic responses. Studies have indicated that Rh-negative individuals have an 80% chance of making an antibody to D upon exposure to 1 unit of D-positive red blood cells. Manual tube testing. Image created by Jay Parsley. Column agglutination "gel card." Image created by Jaye Parsley. There is specific terminology involved in testing for Rh groups. Transfusion of a recipient requires a type and cross to be completed before blood is issued to prevent Rh incompatibility. A type and screen is one of the required tests for blood donation. The recipient has a type and screen performed to assess Rh compatibility between the recipient and potential organ donors. Hematopoietic stem cell testing is the only instance when Rh type does not have to be identical. Donor hematopoietic progenitor stem cells will engraft into the recipient's chemotherapy-induced "empty" or "wiped out" marrow and replace the recipient's blood ABO type and Rh type if the engraftment is successful. A type and screen is one of the required tests for organ/hematopoietic marrow donation to assess donor compatibility for an intended recipient. Evaluation of hemolytic disease of the fetus and newborn (HDFN) that is associated with Rh incompatibility involves multiple steps. HDFN occurs when a fetus has antigens on his or her red cells that the mother's immune system does not recognize as her own (usually an Rh-negative woman carrying an Rh-positive fetus). A small percentage of fetal blood may come into direct contact with the maternal blood circulation through fetal maternal hemorrhage (eg, amniocentesis, trauma, miscarriage/abortion, or placental abnormalities). Certain antigens on fetal blood cells, like those of the Rh system, are more fully developed and are present in greater numbers than others. This allows the mother's immune system to easily recognize them and produce antibodies that may cause hemolysis. Anti-Rh antibodies are mainly immunoglobulin (Ig) G. The mother's IgG antibodies, because of their smaller structures, are able to cross the placenta and attack fetal red blood cells carrying the Rh antigens, causing fetal hemolysis. Once the mother's Rh antibody is identified, titers and a score are used to assess the amount of antibody present in the mother's plasma and to evaluate its strength/avidity. Clinicians then use this information to predict the risk of fetal hemolysis. Titers and scores are performed in a blood bank reference laboratory. A sample of the mother's blood is centrifuged to separate her plasma (which contains the antibody) from her red blood cells. The plasma is then serially diluted and combined with reagent Rh-antigen–positive red cells. Agglutination or lack of agglutination is visually assessed. A score is then determined based on the strength of agglutination associated with each dilution. In order to prevent HDFN arising from an Rh-negative mother in the first place, several steps can be taken. In the United States, when fetal Rh(D) status is unknown, Rh-negative pregnant women are given a form of Rh(D) immunoglobulin (ie, RhoGam or WinRho) at approximately 28 weeks’ gestation. Additional doses are administered after any procedures and at the time of delivery. Clinicians can also use amniocentesis samples to verify fetal Rh(D) status to predict current or future risk for HDFN due to Rh(D) incompatibility. A less-invasive molecular genotyping procedure has been tested and used in portions of Europe. Throughout pregnancy, particularly during the second and third trimesters, fetal DNA is present in the pregnant woman's plasma. A blood sample from the pregnant woman is taken and separated via centrifugation. If the fetus is Rh-positive, the fetal RH DNA can be amplified and detected by polymerase chain reaction (PCR). The genotyping results assist in determining the fetal Rh(D) status. If the fetus is deemed Rh-negative, the pregnant woman may not need to receive the Rh(D) immunoglobulin to prevent antibody formation. In a review of the literature from European centers that implemented large-scale nationwide noninvastive fetal RHD typing in the second trimester for targeted Rh(D) immunoglobulin administration, investigators found that depending on patients' ethnic backgrounds and the medical institution, fetal RHD typing using a duplex real-time PCR can safely and cost-effectively guide the administration of Rh(D) immunoglobulin to prevent D-alloimmunization during pregnancy. They calculated the unnecessary administration of 40% of antenatal Rh(D) immunoglobulin could be avoided, and cord blood serology could be omitted. Rh(D) typing is usually performed at the time of ABO typing and antibody screening. A blood sample is placed in a centrifuge, which separates the red blood cells from the plasma. The individual's red cells are diluted to make a working suspension (2%-5%) in saline. The red cell suspensions are then mixed with anti-D reagent. 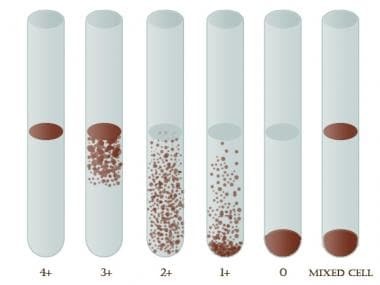 A limitation to Rh typing is the amount of sample that is required to perform ABO and Rh typing using the standard tube testing, column agglutination method, or solid phase test systems: approximately 1 mL of blood. Factors that can interfere with a type and screen are discussed below. A history of Rh immunoglobulin (RhoGam/WinRho/Rhophylac) administration can cause interference with a type and screen. Rh immunoglobulin is used mainly in obstetrics to prevent hemolytic disease of the fetus and newborn (HDFN). In theory, the medication is composed of anti-Rh (D) immunoglobulin (Ig) G antibodies that will coat small amounts of exposed fetal red blood cells, which should prevent the mother's immune system from producing anti-D. In subsequent months, up to 6 months after receiving Rh immunoglobulin, the mother's plasma shows the presence of anti-D, which is interpreted as passively acquired anti-D secondary to Rh-immunoglobulin use; thus, there is no clinical concern for hemolysis. The mother still receives Rh-negative blood products if transfusion is indicated. Another scenario that causes interference with a type and screen is that of an Rh-negative individual who received Rh-positive red cells because of a low inventory of Rh-negative blood; this person will show newly formed anti-D alloantibody. This is a true alloantibody situation and is mainly reserved for Rh-negative males or Rh-negative females beyond childbearing age. The patient should subsequently receive Rh-negative blood products to avoid hemolysis. 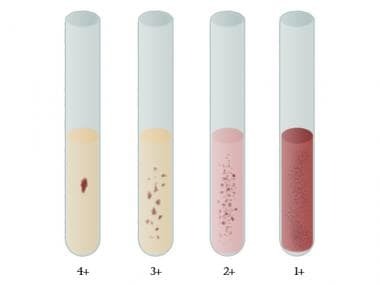 An individual's red cells (in a 2%-5% saline suspension) are mixed in a test tube with anti-D reagent. The specimen is mixed gently. After centrifugation, the pelleted cell button is gently resuspended and examined for agglutination. Agglutination indicates a positive reaction. The reaction is graded on a scale of 0 to 4+. See the following image. An individual's red cells are initially mixed in a small gel-filled tube that contains reagent anti-D. The specimen is centrifuged and assessed for agglutination. Agglutination seen at the top indicates a strong positive reaction; agglutination seen at the bottom signifies no reaction. The reaction is graded on a scale of 0 to 4+. See the image below. Commercial anti-D reagent is embedded in the bottom of micoplate wells. An individual's red cells (in a 2%-5% saline suspension) are mixed together with an enhancing reagent and centrifuged. The plates are then assessed. If there is just one tightly packed red cell pellet at the bottom of the well, there is no reaction. If there is a covering of red cells throughout the bottom of the well, this would indicate a positive reaction. The reaction is graded on a scale of 0 to 4+. See table 3 below and the images above for further description of conventional agglutination grading. What is Rhesus (Rh) typing? What is the nomenclature used in Rhesus (Rh) typing? How does the D antigen affect Rhesus (Rh) typing? What is the difference between type and screen and type and cross testing for Rhesus (Rh) groups? What is the role of Rhesus (Rh) typing in transfusion recipient testing? What is the role of Rhesus (Rh) typing in transfusion donor testing? What is the role of Rhesus (Rh) typing in recipient organ/hematopoietic stem cell testing? What is the role of Rhesus (Rh) typing in donor organ/hematopoietic stem cell testing? What is the role of Rhesus (Rh) typing in hemolytic disease of the fetus and newborn assessment? How is Rhesus (Rh) typing performed? What are the limitations of Rhesus (Rh) typing? Which factors may affect test interpretation for Rhesus (Rh) typing? What is the role of manual tube testing in Rhesus (Rh) typing? What is the role of column agglutination in Rhesus (Rh) typing? What are the methods of Rhesus (Rh) typing? What is the role of solid phase test systems in Rhesus (Rh) typing? What are common lab resources for Rhesus (Rh) typing? Daniels G, Finning K, Martin P, Massey E. Noninvasive prenatal diagnosis of fetal blood group phenotypes: current practice and future prospects. Prenat Diagn. 2009 Feb. 29 (2):101-7. [Medline]. Quraishy N, Sapatnekar S. Advances in blood typing. Adv Clin Chem. 2016. 77:221-69. [Medline]. Westhoff C. ABO, H, and Lewis blood groups and structurally related antigens and methods. In: Roback J, Coombs MR, Grossman B, Hillyer C, eds. Technical Manual. 16th ed. Bethesda, MD: American Association of Blood Banks (AABB); 2008. 361-97. Reid ME, Lomas-Francis C. The Blood Group Antigen Facts Book. 2nd ed. San Diego, CA: Academic Press; 2003. Flegel WA. Molecular genetics of RH and its clinical application. Transfus Clin Biol. 2006 Mar-Apr. 13 (1-2):4-12. [Medline]. Price TH, ed. Transfusion-service-related activities. Standards for Blood Bank and Transfusion Services. 5th ed. Bethesda, MD: AABB; 2008. Section 5, Subsections 5.8, 5.11-5.16. Sandler SG, Chen LN, Flegel WA. Serological weak D phenotypes: a review and guidance for interpreting the RhD blood type using the RHD genotype. Br J Haematol. 2017 Oct. 179 (1):10-9. [Medline]. Domen RE. Policies and procedures related to weak D phenotype testing and Rh immune globulin administration. Results from supplementary questions to the Comprehensive Transfusion Medicine Survey of the College of American Pathologists. Arch Pathol Lab Med. 2000 Aug. 124 (8):1118-21. [Medline]. Sandler SG, Roseff SD, Domen RE, Shaz B, Gottschall JL. Policies and procedures related to testing for weak D phenotypes and administration of Rh immune globulin: results and recommendations related to supplemental questions in the Comprehensive Transfusion Medicine survey of the College of American Pathologists. Arch Pathol Lab Med. 2014 May. 138 (5):620-5. [Medline]. Luo X, Keller MA, James I, et al. Strategies to identify candidates for D variant genotyping. Blood Transfus. 2018 May. 16 (3):293-301. [Medline]. van der Schoot CE, de Haas M, Clausen FB. Genotyping to prevent Rh disease: has the time come?. Curr Opin Hematol. 2017 Nov. 24 (6):544-50. [Medline]. Avent ND, Reid ME. The Rh blood group system: a review. Blood. 2000 Jan 15. 95 (2):375-87. [Medline]. Henry J, Beadling WV, Cooling L. Chapter 30: Immunohematology. In: Davey F, Herman C, McPherson R, Pincus M, Threatte G, Woods G, eds. Henry's Clinical Diagnosis and Management by Laboratory Methods. 20th ed. Philadelphia, PA: Saunders; 2001. 669-73. Rh blood group system. ClinLab Navigator. Available at http://www.clinlabnavigator.com/rh-blood-group-system.html. Accessed: July 21, 2016. Zhou L, Thorson JA, Nugent C, Davenport RD, Butch SH, Judd WJ. Noninvasive prenatal RHD genotyping by real-time polymerase chain reaction using plasma from D-negative pregnant women. Am J Obstet Gynecol. 2005 Dec. 193 (6):1966-71. [Medline]. Shin KH, Lee HJ, Kim HH, et al. Frequency of red blood cell antigens according to parent ethnicity in Korea using molecular typing. Ann Lab Med. 2018 Nov. 38 (6):599-603. [Medline]. Adewoyin AS, Lee GM, Adeyemo TA, Awodu OA. Rh and Kell blood group antigen prevalence in a multi-ethnic cohort in Nigeria: implications for local transfusion service. Immunohematology. 2018 Jun. 34 (2):61-5. [Medline]. Moise KJ Jr, Gandhi M, Boring NH, et al. Circulating cell-free DNA to determine the fetal RHD status in all three trimesters of pregnancy. Obstet Gynecol. 2016 Dec. 128 (6):1340-6. [Medline]. Noiphung J, Talalak K, Hongwarittorrn I, Pupinyo N, Thirabowonkitphithan P, Laiwattanapaisal W. A novel paper-based assay for the simultaneous determination of Rh typing and forward and reverse ABO blood groups. Biosens Bioelectron. 2015 May 15. 67:485-9. [Medline]. Chen JY, Huang YT, Chou HH, Wang CP, Chen CF. Rapid and inexpensive blood typing on thermoplastic chips. Lab Chip. 2015 Dec 21. 15 (24):4533-41. [Medline]. Gassner C, Utz I, Schennach H, et al. Novel RHD alleles with weak hemagglutination and genetic Exon 9 diversity: weak D Types 45.1, 75, and 76. Transfusion. 2013 Nov. 53 (11 suppl 2):2954-9. [Medline]. von Zabern I, Wagner FF, Moulds JM, Moulds JJ, Flegel WA. D category IV: a group of clinically relevant and phylogenetically diverse partial D. Transfusion. 2013 Nov. 53 (11 suppl 2):2960-73. [Medline]. A special thank you to Jaye Parsely for providing agglutination graphic images.